The greatest water parks in the UK! You don’t have to go abroad to enjoy fabulous water parks – we have some pretty cool ones here in the UK! Here are our favourites – why not try them out if you’re nearby for some splashingly good fun! As the UK’s number 1 Tropical Aqua Park, Water World is an epic adventure for the whole family to enjoy, with a range of 30 thrill seeking rides and activities – from the Space Bowl to the Black Hole – there is something for everyone (even if you just want a relaxing day on a sun lounger or in the hot tub!) There’s even a poolside restaurant for when you’re feeling a little peckish! The North East’s largest indoor water park, Wet ‘n’ Wild offers 10 exciting thrill rides as well as a mini water park for little visitors. Tackle kamikaze, ride The Abyss, or watch the kids enjoying the thrills from the comfort of the Beach Hut Café. Splashdown is home to 13 thrilling indoor and outdoor flume rides, as well as three under 5s splash zones – flumin’ great fun for the whole family! From The Screamer to Buccaneer Beach and plenty in between, there’s lots to keep you wet and busy! Fancy tackling a “Total Wipeout” style inflatable outdoor water assault course? Then head over to the Aqua Park, complete with huge inflatable slides, a trampoline, an inflatable climbing wall, runways and blast bags! The inflatable ninja assault course is the ultimate outdoor water experience. There’s plenty of other action to be had – learn to wakeboard, ride the wake park or waterski – check here for further details. Whether you consider yourself a thrill seeker or just simply want to have a day out with the kids, there’s plenty of fun to be had by all of the family at Sandcastle Water Park. 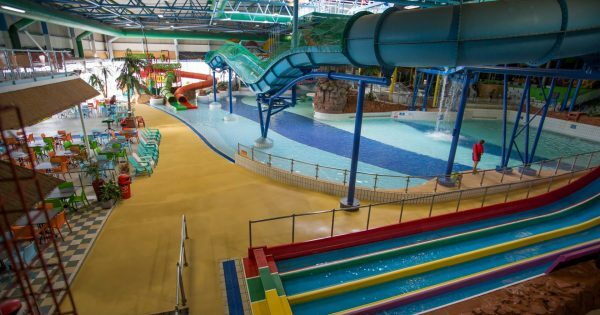 As the UK’s largest indoor waterpark it features over 18 slides and attractions including fun pools, a wave machine, great water based play structures for the younger visitors and much more. Follow the link to find out more information! Have you visited one of these waterparks? If so, let us know over on Facebook and Twitter.